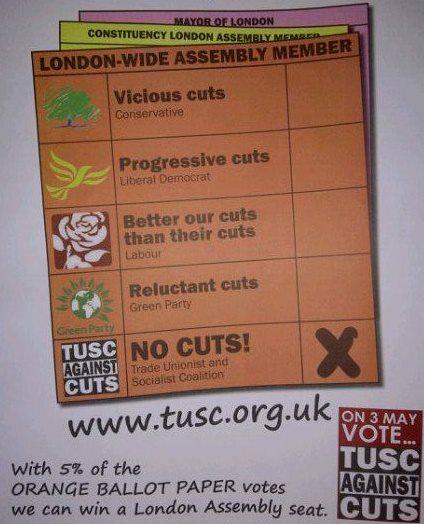 The Trade Unionist and Socialist Coalition (TUSC) is standing a list of candidates in the London-wide member list in the elections for the Greater London Assembly on 3rd May (on the orange ballot paper). 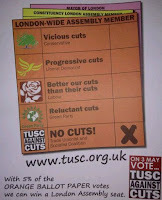 After the Bradford West result revealed the true bitterness felt by many voters at the pro-cuts policies of ALL the main parties - TUSC must have a real chance to get at least the 5% of the poll that's probably needed to get at least one assembly member elected to the Greater London Assembly. This would be a real breakthrough for everyone who wants to defend education and public services from cuts and privatisation. If TUSC succeeds in winning a seat, it will also have the bonus of making it harder for parties looking for 'protest votes' from the far-right - not least the BNP - to get elected too. I am proud to be standing as a teacher on that TUSC list. Education is under attack from this Government: budgets are cut, schools facing forced privatisation, workload at intolerable levels - yet young teachers are told they should work until they’re 68! But, shamefully, New Labour's leadership won't oppose these attacks: Ed Balls won’t reverse cuts, Stephen Twigg supports Free Schools , Ed Milliband opposes trade unionists striking to defend their pensions. Teachers know they can’t just fight cuts and privatisation through trade union action alone. We also need political representatives that will speak out in support of union policies. That's why this list of leading trade unionists is standing in the election to say no to all cuts and privatisation. The list now has the backing of three trade unions general secretaries: Bob Crow of RMT, Matt Wrack of FBU and Steve Gillan of POA. The full list of names on the Trade Unionist and Socialist Coalition list in the Greater London Assembly elections is as follows: Alex Gordon, president of rail union RMT; Nick Wrack, TUSC national committee; April Ashley, Unison executive, representing black women members; Steve Hedley, RMT London organiser; Ian Leahair, Fire Brigades Union national committee member; Gary McFarlane, Black activist and journalist; Martin Powell-Davies, executive member of the teachers union NUT; Merlin Reader, postal worker; Joe Simpson, assistant general secretary of the Prison Officers Association; Jenny Sutton, college lecturer, UCU union; Nancy Taaffe, library worker made redundant, Waltham Forest Unison; Jackie Turner, doctor; Lee Vernon, PCS Young Members convenor for London; Lesley Woodburn, Unite rep on southeast regional TUC LGBTQ committee; Mick Dooley, construction industry activist; Mark Benjamin, black disabled PCS union activist.